Lack of support for maternity returners among UK businesses has been uncovered in a new survey of professional, mainly management-level women. Download a PDF of the Survey results here. More than four fifths of pregnant women begin their maternity leave unhappy and lacking in confidence about work – and over a third feel so isolated when they return that they want to hand their notice in. MMB, the working parents’ website, surveyed more than 1,000 mothers, 72% of whom were in jobs at management level or above. In response to its findings, MMB has launched a campaign, #LeaveLoudly and #ReturnLouder. 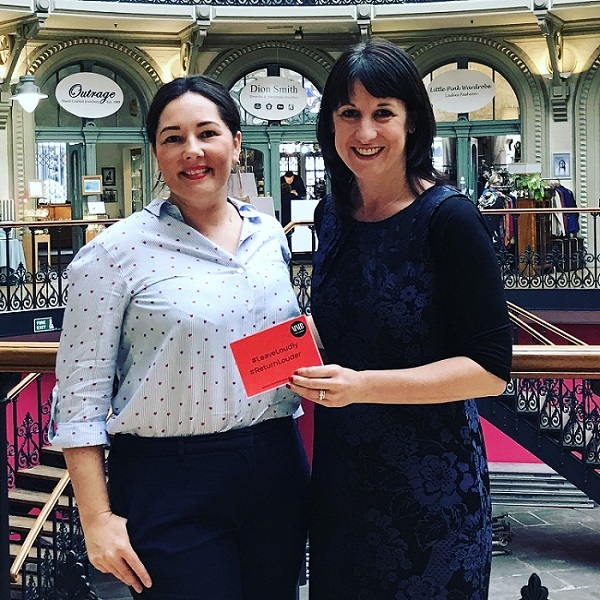 Backed by the Leeds West MP Rachel Reeves, it will empower women to call for better treatment and offer a maternity returners’ programme for businesses. 60% were worried about their requests for flexible working being rejected and 68% had concerns about the cost of childcare when going back to work. Abbie Coleman, founder of MMB, said: “Our survey shows it’s time for action, not just talk. #LeaveLoudly is about senior managers doing just that, to help normalise flexible working and change working culture to focus on production, not presenteeism. The Labour MP for Leeds West, Rachel Reeves, herself a working mother, is supporting the campaign, alongside business leaders and academics. She said: “The challenges facing parents returning to work after the birth of a child are immense. Many have to juggle caring responsibilities and running a home with fitting back into the workplace. The MMB Returner programme, involving coaching, mentoring and access to a supportive network, was developed by Abbie Coleman and Beckie Taylor, two mothers who are passionate about changing working culture to benefit future parents – and helping companies to retain talented employees. Helen Gration, York business owner and trustee of National Day Nurseries Association, said: “There is a huge reservoir of talent that is wasted by not engaging and supporting women on maternity leave and upon return. Leeds Law Society, which supports, promotes and represents solicitors, said: "While the number of women 'at the top' is improving, there is still a long way to go and law firms are recognising that they are losing a large number of women from private practice as these women start to become more senior. “From speaking to our members, the headline issues are that men need to have a seat at the table during these types of conversations, flexible working needs to be viewed as the norm and not a lesser role to rid the issue of presenteeism, and there is a lack of women role models who can provide coaching/mentoring to support junior women as they progress. As such, we are not surprised to see these results from MMB's survey of women returning to work after maternity. “While some law firms are better than others, there still does not seem to be much promotion of the support that may be available to women returners. Leeds Law Society celebrate organisations like MMB who can offer this kind of support and coaching, we would only ask that the employers shout louder about these initiatives and incorporate them into their own internal policies." The MMB Returner programme supports businesses by providing bespoke programmes for short and long-term returners. The aim is for returners have a successful transition back into their careers through personal and professional development, including workshops, executive coaching, mentoring and access to a network of events. Themes include self care, wellbeing, resilience, unlocking potential and overcoming challenges. With over 16 years in recruitment, Abbie is well placed to know the discussions behind the recruitment doors. After having her young son she decided to launch MMB, with the vision to change the future for working mothers and allow all the chance to achieve career ambitions. MMB has become the leading northern working mother website, championing the working mother to reach all her career ambitions alongside supporting businesses engage these employees. Its goal is to ensure the north is the key business market for the best talent attraction and retention on the market, and to support businesses with commercial practical advice on flexible working, parent networks and events for mid to senior female networks. Beckie is a people professional with extensive experience of working with business leaders to scale up through people. Focusing on talent management, team effectiveness, continuous performance development, building a diverse workforce, and flexible working. She is also an Executive Coach (WABA and RCC accredited) providing real impact and ROI for people on a group and 1-2-1 level. Previously, Beckie has acted as a Global HR Leader, spearheading global growth strategies for international tech companies. These roles focussed on defining culture / core values, building KPI frameworks, continuous development, employee engagement, designing SaaS based HR metrics, and creating people strategies to enhance growth. As part of her work, Beckie is also an Ambassador for Tech and Women in Leadership, and the Co-founder of Women in Technology Northern Chapter. In 2017, she launched Tech Returners. These courses are designed to break down the barriers for people returning to, or starting out in tech. This work has seen the project shortlisted in the Northern Power Women awards for Innovation for its practical guidance, and personal development coaching. Also, recently launching a Tech Future Female Leaders programme which aims to focus on developing the next future role models in tech. She has also been shortlisted in the Women in IT Awards 2017 Advocate of the Year and Voted on of the Top 30 women in tech for Greater Manchester.